I may be rushing the season a bit, as the park does’t open until May, but I wanted to feature a piece written by my husband and musical partner, BIll Purse. When he was commissioned to compose a symphonic band piece for the local North Hills High School, he chose Kennywood as his inspiration and the famous phrase as the title of the piece. Bill has a history of writing pieces inspired by favorite places; Kennywood’s Open featured six vignettes based on his favorite park rides. In the name of research, we made several trips to the park to record the sound of the rides as well as photograph and videotape footage for what eventually became a combination of music and actual sounds from the park and plenty of resources for multimedia presentations. Since its premiere, Bill has rearranged it for orchestra for a performance by the Washington Symphony Orchestra on the very day that the park opened for the season. The concert hall featured an enormous screen and high resolution projector, so I was able to create moving graphics of the park rides while the orchestra performed the piece. When creating his solo CD Sonic Art, Bill adapted the “Merry Go Round” section as a jazz piece featuring Duquesne University’s Catch 22 and jazz trumpeter Sean Jones. This video features the CD recording of The Merry Go Round combined with the Kennywood footage and some stills of Sean taken by friend and photographer Doug Harper. 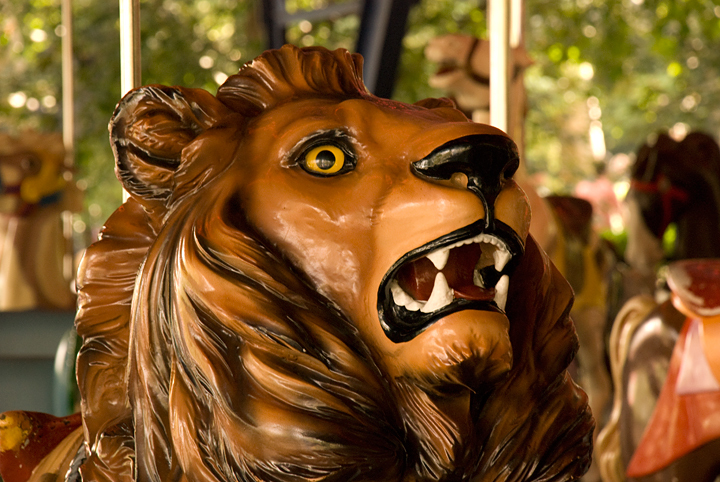 The video features the Dentzel Carousel installed in the park in 1927 and the 1915 Wurlitzer Band Organ whose actual sound begins and ends the piece. This entry was posted in Music and tagged amusement park, Bill Purse, carousel, Dentzel carousel, Doug Harper, Duquesne University's Catch 22, jazz, Ken Karsh, Kennywood, Kennywood's Open, Merry-Go-Round, music, Sean Jones, Sonic Art, Wurlitzer Band Organ by composerinthegarden. Bookmark the permalink. Awesome! I missed this post first time around. Great music and video. What a great combination, and to be able to work on things jointly must be very satisfying. Really enjoyed this post. Maybe one day I will have to hit up Kennywood. This was the first time I have heard about it. Thanks, George, glad you liked it! Absolutely wonderful! You both are SOOOO talented. 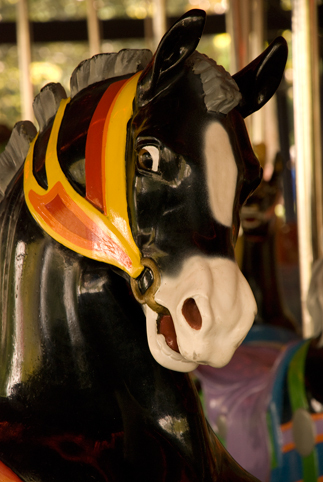 I love carousels and that perfectly captured the great feeling of riding one. 🙂 My Dad has an old Wurlitzer-type organ in his restored concert/dance hall, but sadly, it no longer works. Pretty hard to find someone that can fix these old organs. Oh, that is SO sad that the organ doesn’t work anymore; kind of like the “island of lost toys”! Glad you enjoyed the post; it was so much fun to put together! Ah, music therapy! Glad you enjoyed the video, it soothed and healed you, and yes, that was my bearded hubby smiling while riding by. it really was fun to do live; the screen and projector were fabulous and the experience was transcendent. Glad you enjoyed! brilliantly done! So much fun!! Thanks, Mimo – glad you enjoyed it! Just plain loved it !!! I really enjoyed that. Thank you! Robin, how neat that you were there! It is a favorite place of ours, big enough to be engaging for the day but small enough to be manageable. Some of our students work there and a lot of musicians we know play there in the summer. I have lots of childhood memories of the place and still enjoy many of the same rides that were my favorites. Thanks, Lance! Sean is one of the top trumpeters in today’s jazz scene; we count ourselves fortunate to have him as a colleague and friend. Just pulsing with creativity! It’s raining here today, but by the end of this, I was mentally wearing shorts and sunglasses, and kicking back , watching the carousel whirl: thank you! Thanks, Brett – glad you enjoyed it. Bill loved using the organ sound and its “out of tuneness” as part of the piece and Sean loved playing over that final chord! Awesome! I enjoyed this very much. Loved the way the Wurlitzer starts and ends the piece as it acts as the perfect bookends … and yes, the opening of amusements is a good sign of what is to come. Thanks, Frank! This was a lot of fun to do, from collecting the material to creating the video. Now I can’t wait until Kennywood really opens for the season!